The design of the 8000 Series Tractor aimed to improve visibility, enhance serviceability, and achieve a 99% turning radius. The period from 1976-1981 saw Deere & Company complete more than $1.5 billion in capital investments, the largest such expenditure in company history. Much of that investment was centered in the newly designed John Deere Tractor Works in Waterloo, Iowa, which became fully operational in 1981, building 225 tractors a day. A leading engineering publication cited the facility for “excellence in the application and development of computer-integrated manufacturing,” in recognition of its use of computer-aided production. And then, the Farm Crisis of the 1980s hit, with conditions more severe than any since the Great Depression. Tractor production in Waterloo fell to 15 tractors a day, with 10-12 at a time stored for future sale. Deere engineers continued to conduct extensive studies around future tractor design, but there was a limited environment for development opportunities. 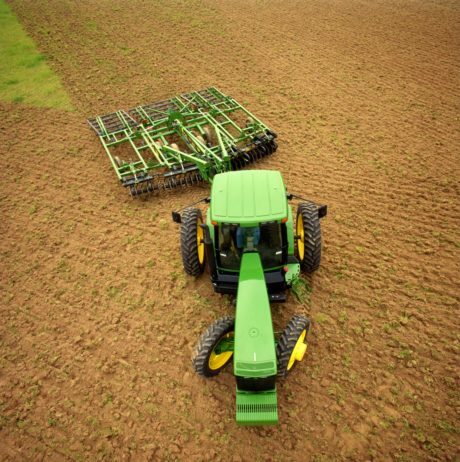 Questions about the company’s tractor strategy and what the next generation of tractors should look like were numerous. Overall company sales steadily fell, from a record $5.5 billion in 1981 to $3.5 billion in 1986. 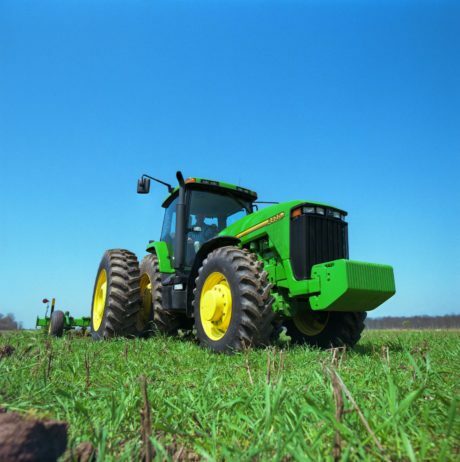 Initial plans called for modular construction of large tractors. The concept worked well for small tractors, but there were challenges with decreasing row spacing that the large tractor platforms could not solve. With approval to continue development of the large modular tractor, design engineer Terrill Woods found himself restless during a flight from Chicago to Paris in March 1987. He began thinking about the design, found a scrap piece of paper, and started sketching. The design team’s goal was a 99% turning radius, which seemed impossible. Later that night Woods awoke with an idea to raise the engine up dramatically above the front axle, and design a drop box transmission, eliminating the need for side frames. The design would provide improved visibility, enhanced serviceability, and achieve the desired turning radius. The next day, over breakfast, Woods showed his sketch to colleague Lyle Madsen, a drive-train engineer. Madsen made suggestions, such as incorporating the PTO into the drop-box transmission. Together, the two men made notes in pencil over the original drawing, which was in blue ink. The drawing was carried back to Waterloo and filed away. But while the design team worked on their large modular tractor, they also blocked off an experimental area on the assembly floor, taking existing parts from other tractors to build a running mock-up of the new design concept. In 1989, while the U.S. farm economy was in its second year of recovery, the mock-up was taken to a test site in Arizona. It was here that the famous “figure 8” photos were taken, showing the new tractor turning a figure-eight inside of the tightest turning competitor tractor. 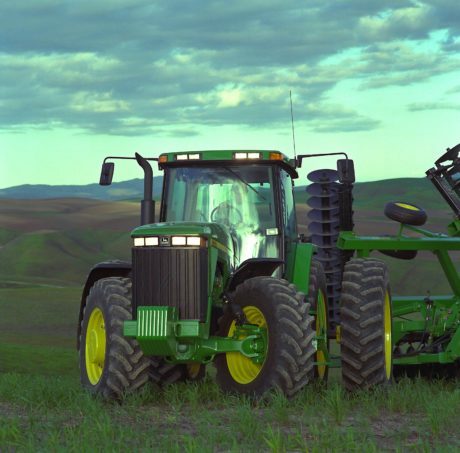 Introduced in 1994, the 8000 Series Tractors were the original John Deere tractor designed exclusively with 3-D geometry and “design-to-manufacturing” processes. 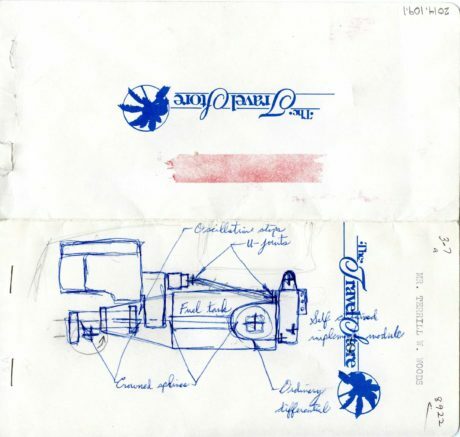 Drawn on an airline ticket envelope on a flight from Chicago to Paris, today the initial concept sketch is part of a digital exhibit at the Smithsonian National Museum of American History in Washington, D.C. recognizing significant “napkin innovations” in American history. And more than 20 years later, the trailblazing 8000 Series Tractors remain in production at Waterloo Works, as well as Montenegro, Brazil, and assembled in Domodedovo, Russia, serving farmers around the world. If you enjoyed reading about the history and development of John Deere's 8000 Series Tractor you might also like reading one of the stories below.